I, like many people, commute to work by train everyday!! In Boston it's known as the "T." Taking the train to work is really easy and for the most part doesn't really bother me. I enjoy not having to worry about parking and whether there will be traffic that day. My commute door to door is at most 30 minutes, like I said - pretty easy! 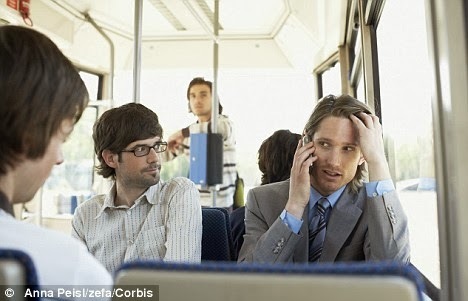 I've recently started to pay attention to the people around me on the train (I probably should be paying attention all the time...) and have found myself either shaking my head in disbelief that someone can do such things in public or screaming silently to myself, willing my stop to arrive! Below are some of my favorite infractions that commuters and train operators make! The person that does not have enough time in their morning routine to put their make-up on AT HOME!! The best is watching a girl attempt to put liquid eyeliner on - good luck getting a straight line with all the stops! via - not me although sort of looks like it! Taking the train with people that are not normal commuters - for example Red Sox fans that flock into the city during what feels like the entire year - but is really only during baseball season - which somehow lasts an eternity! The best part is that almost all trains go to Fenway and they all seem to flock to the train that I'm on!! Now we come to the person that has annoyed us all - regardless of where we are!! The loud obnoxious cellphone talker! Even worse when they are talking about private matters! I've witnessed a girl break-up with her boyfriend, a guy find out his girlfriend (i think) was cheating on him and a son getting berated by his mom for not calling enough! Number 4 is dedicated to all things train operator related. The train operator that decides for no particular reason to drive the train like he stole it! I feel bad for people that have motion sickness all the time - because at some points I'm surprised I've made it off the train alive. Why is it that on some days I can stand over the yellow line but other days I have to be behind the yellow line? This one I just don't get! The train operator that decides to take the train "express" during rush hour when you're coming home exactly one stop before yours!!! This perfectly explains how I feel when I make it onto a packed train! This is my personal favorite- the person that just can't get enough sleep at home. 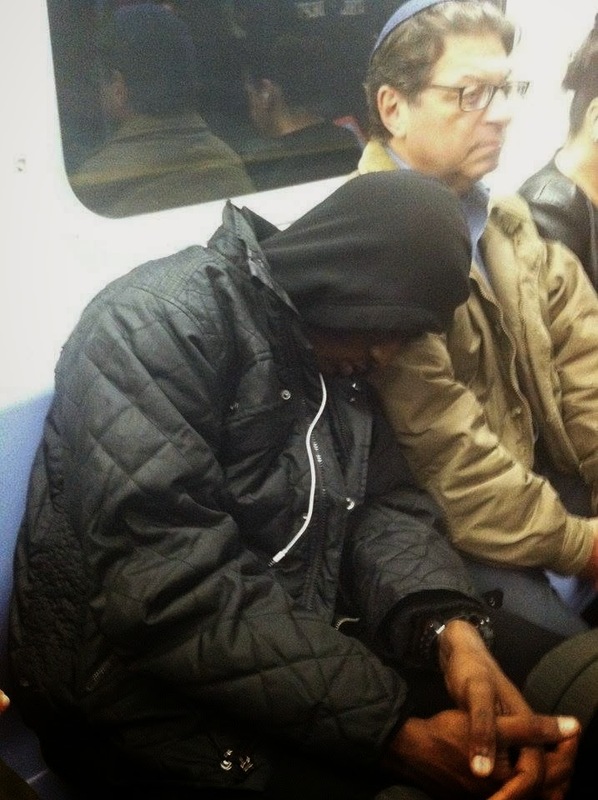 I don't think you can fully appreciate a commute until someone has fallen asleep on you. I can't find the picture of the girl who fell asleep on me - but I guess we've all had those really long days! And now I'll leave you with how I feel when I come to the platform and my train is approaching! Lol! I've witnessed people fighting/breaking up over the phone out front of my work... Super awkward lol I'm sure your always in for an interesting day on the train! Haha these stories are great! 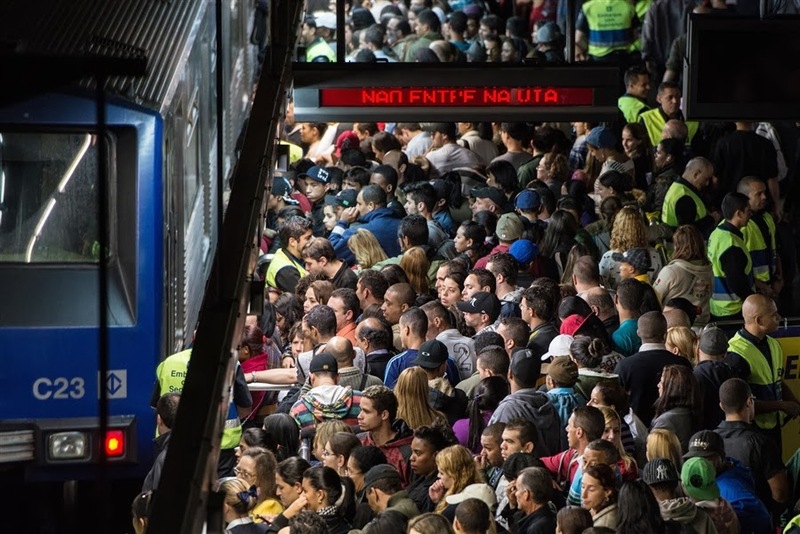 I don't take a train everyday but growing up I used MARTA in Atlanta (which leaves much to be desired as far as public transit goes) but nevertheless I have experienced some of these things too. Plus the token drunk man asking for money :) Let us know if you have any more funny train encounters!! Ahhh the commuter...I live pretty close to Riverside on the Green line, and whenever I have to take it into the city I have to psych myself up...SO MANY STOPS!! Sometimes I prefer to take the bus, but all of these still apply there, especially the operator rant!! Sometimes I don't know how they got their licenses!! I wish I could commute by train to work! Since we don't have anything like that here I get stuck sitting in traffic every morning and funny enough, I see some of the same things sitting in traffic! I almost ALWAYS see someone doing their makeup in the rearview mirror, and not even kidding, I usually see someone reading a book. People watching is so fun! This is great! It's so crazy because the only time I've ever been on a train was when we visited Chicago in October. It's like a whole new world haha! This is too funny! My liquid eyeliner would be a hot mess! It already is and I do it with my feet planted on non-moving ground at home! People having long, loud conversations on their phones kill me. Haha! You're too funny :) I can't stand when people talk on cell phones in public! I never have more than a quick 2 sentence convo, especially when I know people can hear me! Bahahaha this is too funny!! The only time I've used trains for getting around was when we were in France for 2 weeks, but I can totally understand where you're coming from, because we had some crazy experiences in just 2 short weeks!! Hope you had an uneventful train ride this morning! Thanks so much for stopping by!! If you have a blog please link back - would love to check it out as well!! Lol. This is too funny! I can not even imagine having to take a train to work everyday! On my drive to work, I don't typically see one vehicle for about 20 miles! :) I can't imagine the silly/stupid/annoying things you see! yes!!!! loving your gifs with this one!!! It always amazes me to see people sleeping on trains....I mean the paranoid one over here....like what if I miss my stop or someone robs me? I'm such a pushy person in situations like that whenever we travel Mark's always like "we'll catch the next one" and I'm like "we are skinny...we'll fit!" Love this post girl! haha! I love it. I WISH I could take a train to work! Indianapolis does not have great public transportation or any trains. I loved when I lived in NY for a semester and took the subway everywhere. It was so easy and less stressful during the winter! I had to take the train shortly after college and the stopping made me sick to my stomach. I am so glad it was short lived. I get really claustrophobic. This is hysterical!! I have a coworker who uses public transportation, and she said she sees people shaving on the bus!! Talk about nasty!! Was someone seriously trying to put on liquid eyeliner on the train??? 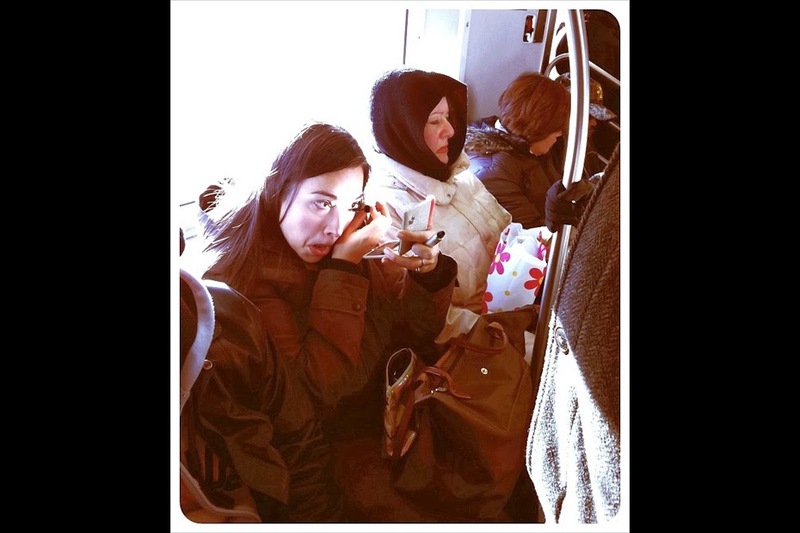 I don't get this whole "doing my makeup on the train/bus" thing. Fixing your lipstick/lipgloss? Maybe. But doing your whole makeup? Nnononono. haha i love this! i analyze the same type of behavior on planes when i'm traveling!! i PRAY they do not start letting people talk on cell phones during flight. I will start hitch hiking! haha I love this!! I'm obsessed with the operator on the red line who always pronounces "institute of technology" in a funny voice. Kills me everytime! Haha!!! I don't take public transportation to work but living in Chicago for the past 3.5 years, I've definitely experienced all of these! Except no one has actually fallen asleep ON me.. but I have seen people sleeping and wondered if they were even alive! This cracked me up! My best friend lives in Boston so I feel like I have seen all of these things happen on my few trips on the T. My friend told me she once saw a guy with no pants on!